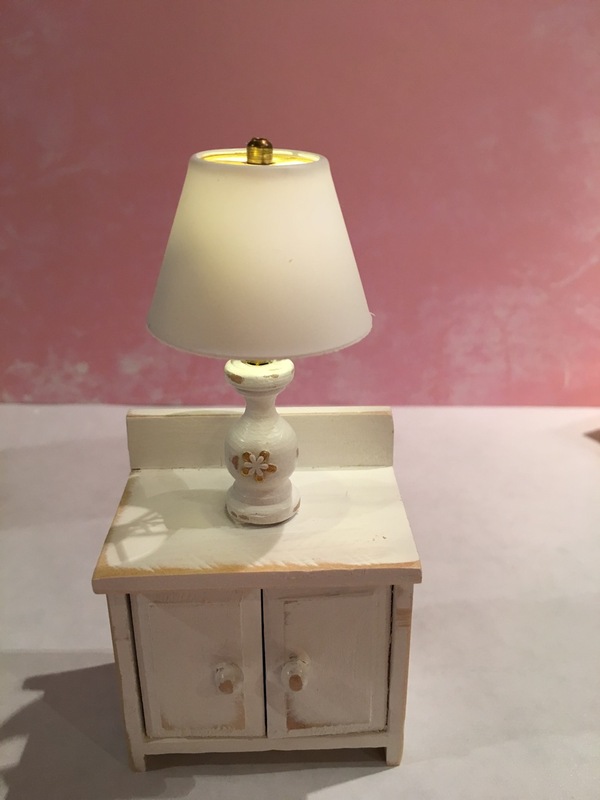 I'm making lamps for the attic bedrooms. This one is for the girl's room. 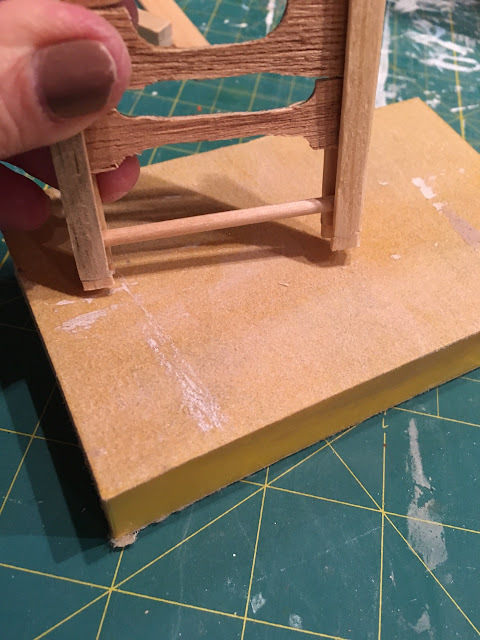 My original instructions came from Dollhouse Miniature Furniture Tutorials: 1 inch. 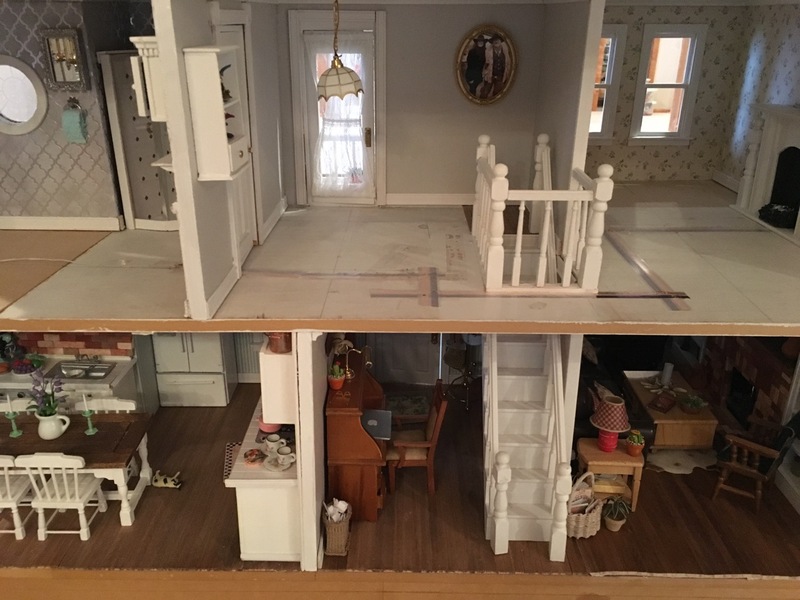 I was thinking about how much work we go to create a room to make it believable, charming, and realistic and that's what makes the hobby so much fun, living out our fantasies, revisiting our childhoods, maybe, channeling our creative nature. And I am so glad that you are here with me. Thank you. So before I get down to business here, I posted my electrical problems on the Face Book group that I belong to that focuses on tutorial and how-to's. 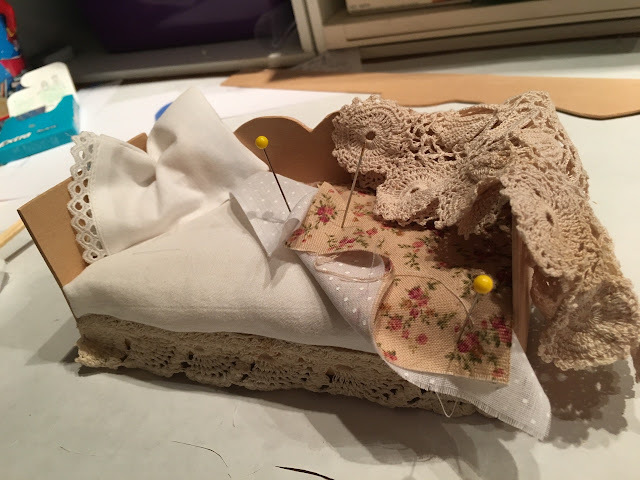 I don't think that I am allowed to to mention my blog there, so I am re-writing the tutorial that I wrote for Face Book. 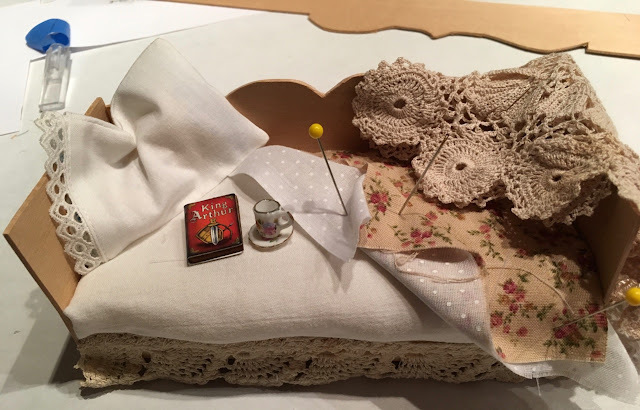 I have sosmetimes directed readers to go the blog, asking them to comment if they visit, but it is very hard to get them to sign on or leave a comment, so I am ever grateful for the handful that visit me here and take the time leave a little something to make me smile. 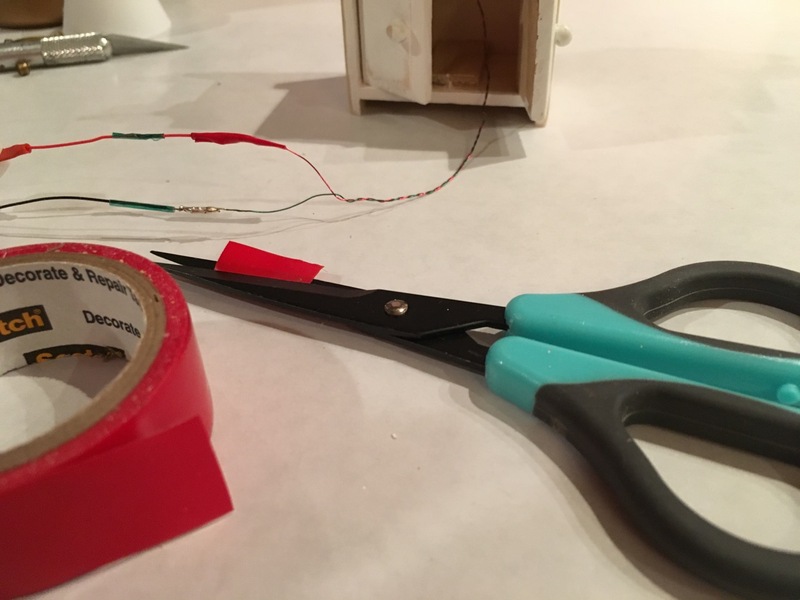 More importantly, however, aside from my own ego, are the horror stories that those miniaturists told about their own experiences with the MFD kits and tape wire. Seems that a lot of people have heart ache over the eyelets or brads coming loose from the composite wood. 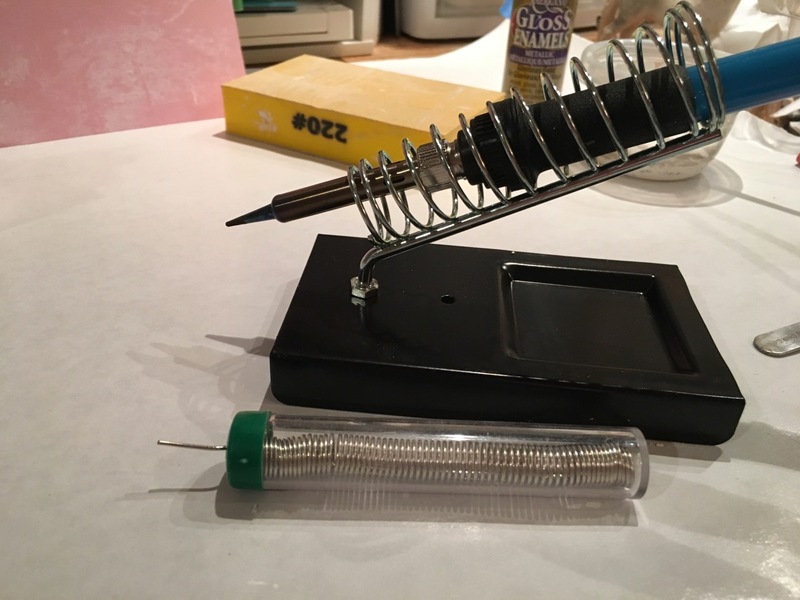 Round wire and batteries seem to be the solution, but there is another that I have seen on Greenleaf's forum, so I began to practice yesterday: Soldering. A bit scary at first, but I think I am getting the hang of it. Might need stronger glasses, tough. My bifocals may need updating. 😁My sweet hubby bought me a simple soldering kit from Amazon, so I finally got brave and tried it out, after doing a bit of reading about how to use it. 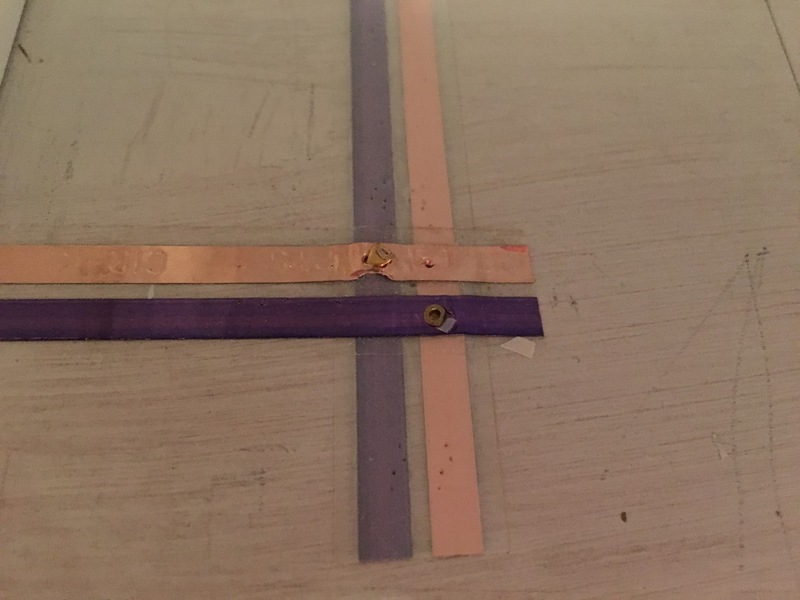 I put a piece of copper tape on a little piece of wood, striped off the plastic covering and went to work. A bit messy, (and out of focus), but I got the hang of it. The connections are secure and strong. Could this be our answer to brads and eyelets? I practiced connecting wire to wire, using round wire and with some practice I think I have that down, too, except for the glob that is not good. 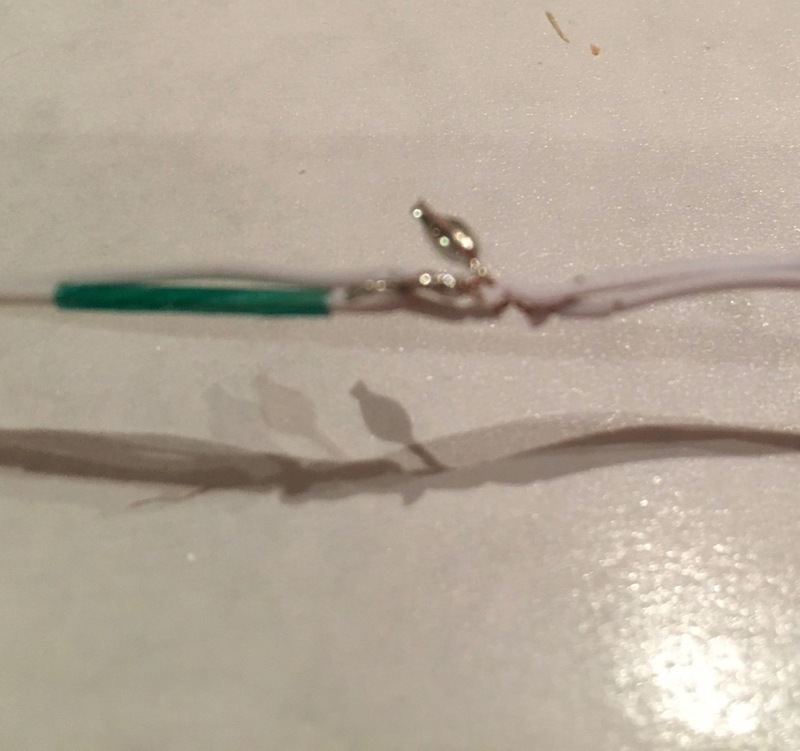 The one comment on Face Book said that it is a weak spot and told me to flux to help the flow of the solder and to help it attach to the wire. 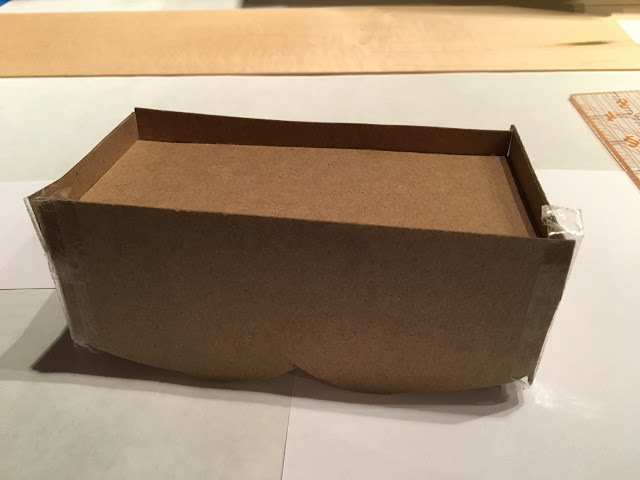 One note: the small shrink tubes will not fill over the joint. I have larger ones, but they add bulk, but soldering these splices is superior to just twisting wires together and putting the shrink tube on because the splice is not secure. Solder reduces that mishap. Hobby Lobby cabinet. Cheap. I don't like to paint or drill my vintage Shackman furniture. jewelry finding: tube. probably 1/32-3/32 in diameter. Lamp shade kit. This one is out of order on most sites. 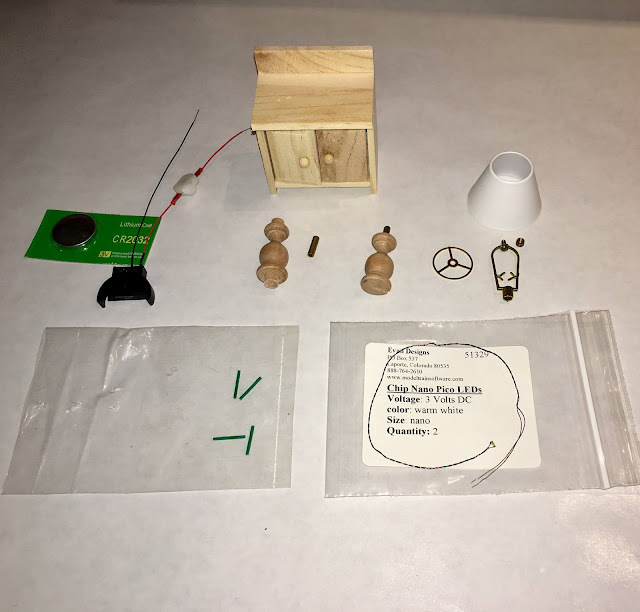 Very hard to find, but there is a lamp kit in the online stores that has all of the parts or you can visit 1 inch minis to see how Kristen builds support for the lamp shade and you will find dozens of tutorial on Pinterest for lamp making and lampshade patterns. Search 'lamps' on my side and you will find my previous tutorials. Tool: drill--either a thumb drill or a Dremel. 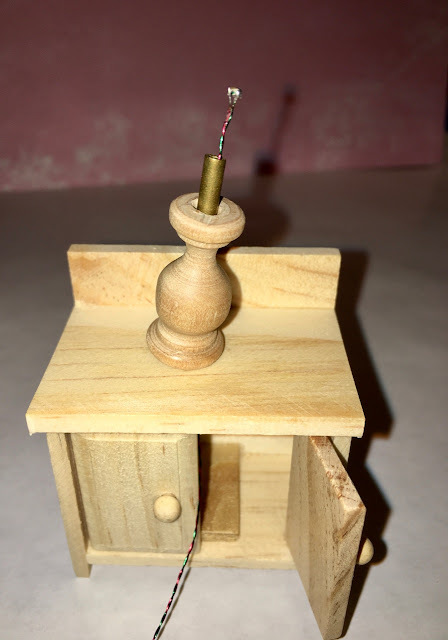 I put my spindle in a vice on my workbench in the garage to secure it in place then use my Dremel with the round cutter blade to remove the ends of the spindle and to drill. 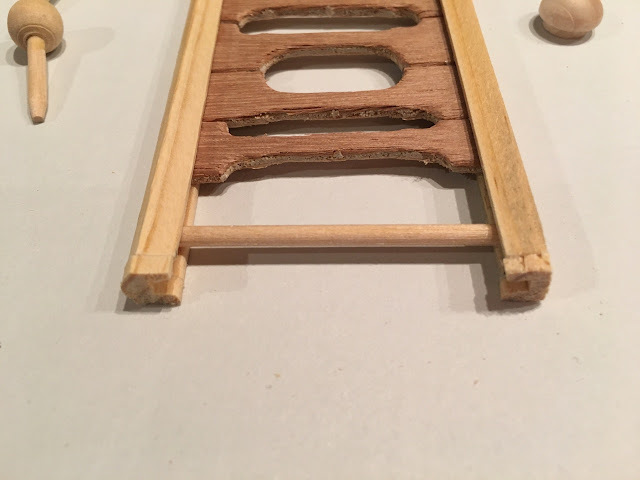 I used two bit sizes to drill the hole: 1/32 and then the 1/16. You may have to use a sharp blade to hollow out the top of the hole to make your jewelry tube fit. To splice the wires from the battery to the LED together, read the instructions that come with the light, but it is red to red. Green to black. The wires on the left are the batter. Do not insert the battery yet to avoid a possible short. 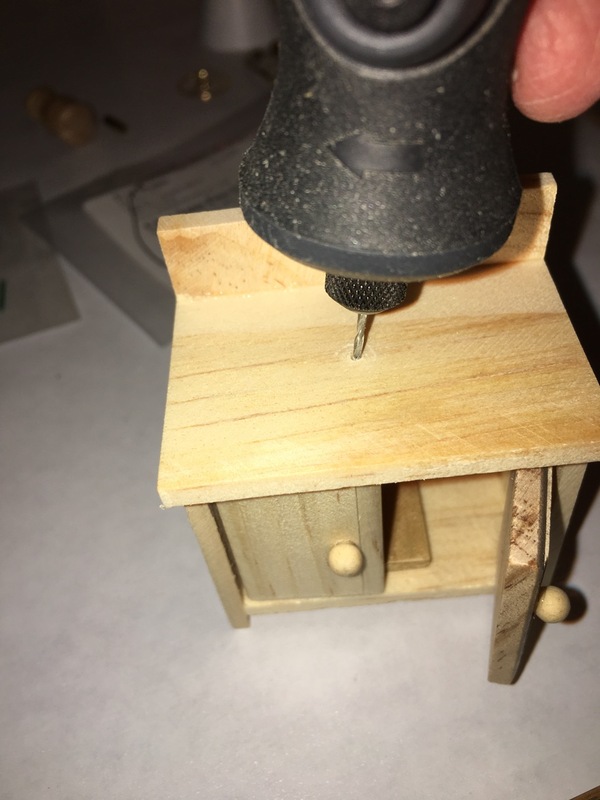 To begin: drill a small hole in the top of the furniture piece that you hide the battery. 1/16 bit or big enough to accommodate your wiring. Assemble your lamp. Insert the jewelry tube, insert the LED. Now begin splicing the LED wires to the battery wires. Twist the wires to tether. 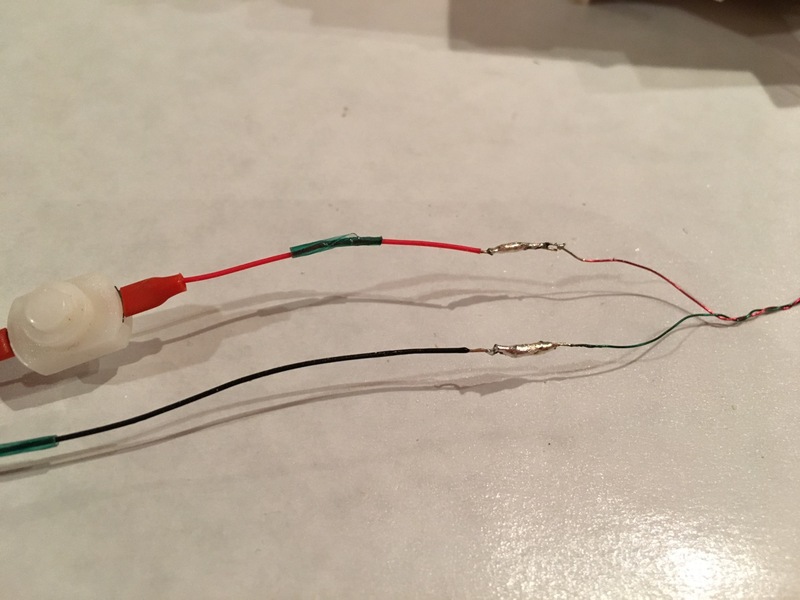 The LED wires are much smaller than the more rigid battery wires, so it is sort of a one sided twist. 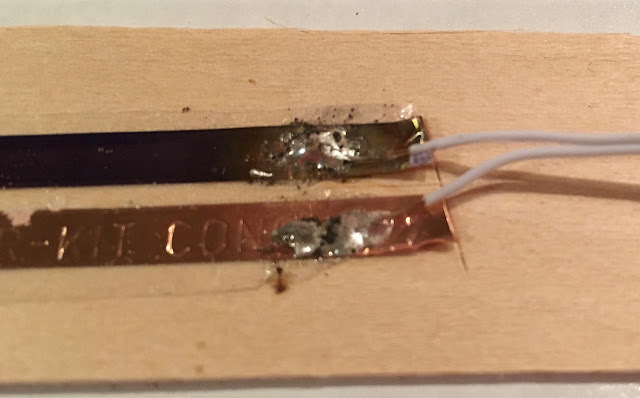 If you are going to use shrink tubes instead of solder, put them in place before splicing the wires. Solder. I think for my very first try, I did okay. the shrink tube will not slide over this splice. So I cut a small piece of regular electrical tape to keep the bare wires from touching, avoiding a short. Not very pretty, but the splices will be hidden. 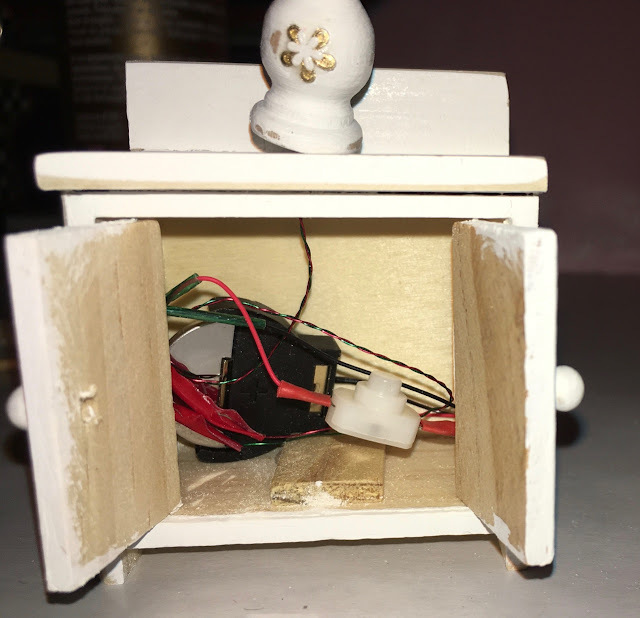 I wind the wires in a circle and tuck them inside the cabinet, with the switch easy to get to. 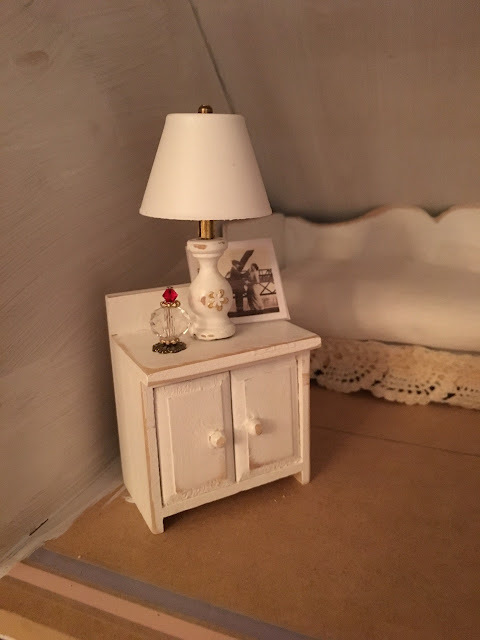 I used craft acrylic paint, two coats and fingernail decals. Some who are talented (I am not) can paint their decoration, use water slide decals, cover shade with fabric or wallpaper or craft paper. Create whatever looks you want. I love my lamps. Search 'lamps' to see my other lamps. 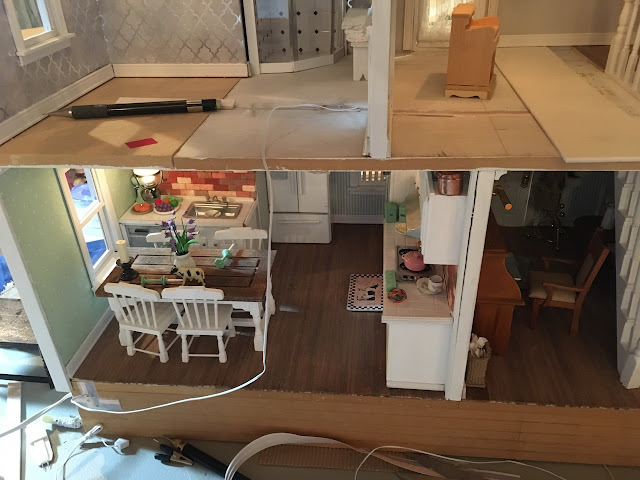 I am excited to get this little room finished. I have wallpaper on order. Oh and the little photo. I love that one. It's grand parents celebrating their wedding by eating cake on a bride to somewhere. Early 20th century, Kansas. My dad was born in 1917, so 1918. They are married in a double ceremony with grandpa's brother and his bride, Renny and Goldie. Finally, the Bellingham farmhouse lighting has been patched. It was a messy fix. 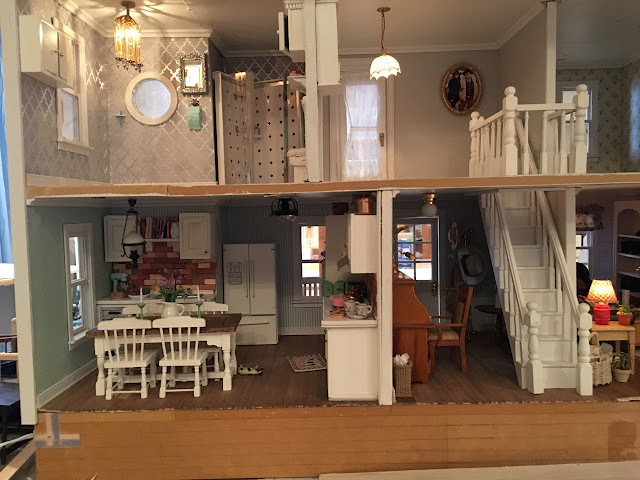 I simply ran round wire from the point of origination for the electrical system to the wire on the second floor where the kitchen lights are connected and the lights are on, again. I'll hide the wire best I can. I do think that I will end up soldering the top connection because it tends to be sensitive to touch since the eyelets don't seem to be in tightly secured or the wires or something. Have great weekend. Next, the Roy Rogers lamp. The Farmhouse is giving me fits. I want to finish it up and move it out of the workshop, but it has issues with lighting--the lights have always given me problems. I have redone the tape writing more than once on the second floor and I thought I had it all the bugs worked out, including the excess humidity in the basement from the aquariums, but the two lights in the kitchen have remained troublesome, so I did what I didn't want to do, pulled up the flooring the second floor to get to the wiring for the kitchen. I had adhered the flooring with carpet tape, really sticky stuff, so that I could remove them if I had to, and I guess I had to. Here is the culprit joint. I put in new brads and had a connection then I didn't. Then I fiddled with it more and ended up shorting it out because now the only line that works for the living room. I am bummed to say the least. I did find a live wire on the ceiling of the kitchen that I ended up not using, so I think I can do some rerouting--I hope. Otherwise, it is lights out in the Bellingham Farmhouse because I am NOT ripping of wallpaper in the bedroom. 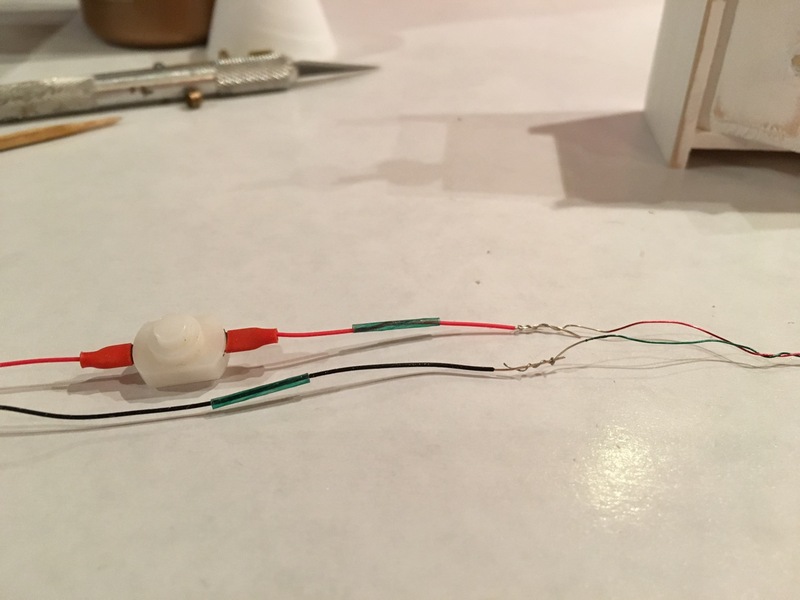 Has anyone used solder to secure wiring? My husband bought me soldering iron which I have not yet used, but I am about the use it. I've read some tutorials and soldering seems to be a good choice. Is it? The attic of the farmhouse needs to be finished. I have the boy's bedroom figured out, wallpaper chosen from my scrapbooking stash, and a tongue depressor floor ready to stain. With a Roy Rogers' theme, the room is going to be such fun, but there is the other half of the third floor. 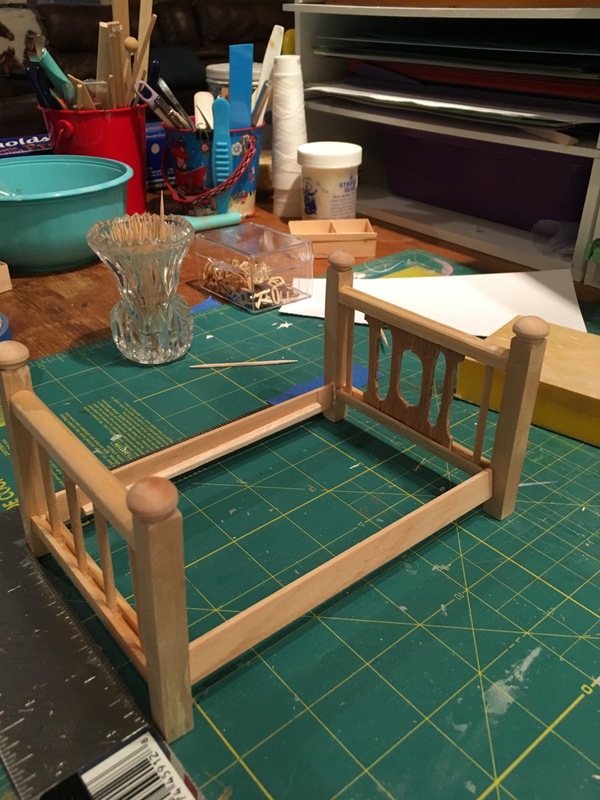 I'm not sure now just what inspired me, but I decided to create another room and wanted a daybed, so I searched Pinterest for daybeds and found Caroline's tutorial on her daybed at Cinderella Moments. Her pieces are simple, easy to execute, and use common products. So here is my little daybed. First I made a prototype out of cardboard just to see if I could manage it. Actually, I wish I had taken more time and done a better job, because it turned out okay. I'm going to clean it up and maybe make a bed for one of the girls. I re drew my pattern, making sure that all the measurements were accurate. I used 1/16th" Bass wood that cut easily with a sharp knife. 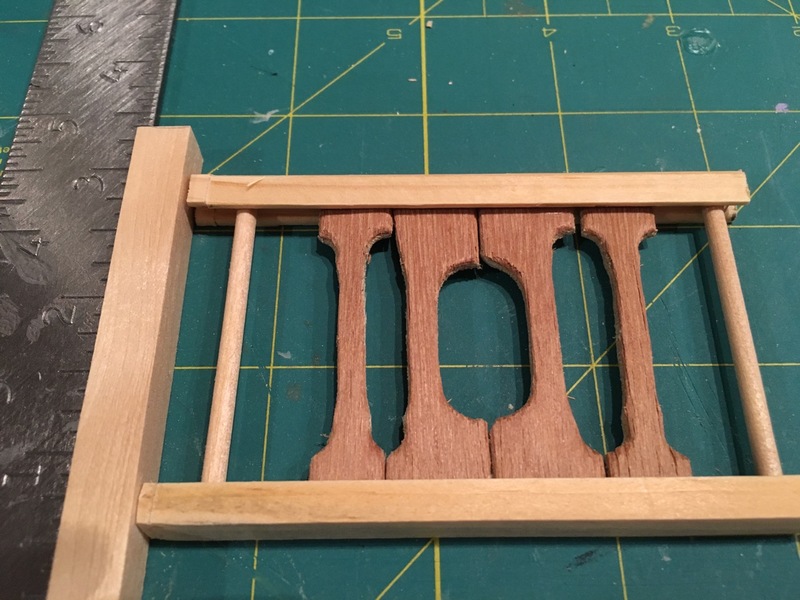 For thicker wood, I would have used the scroll saw. Caroline's headboard has straight lines, but I wanted curves, so I folded the pattern in half and cut away. 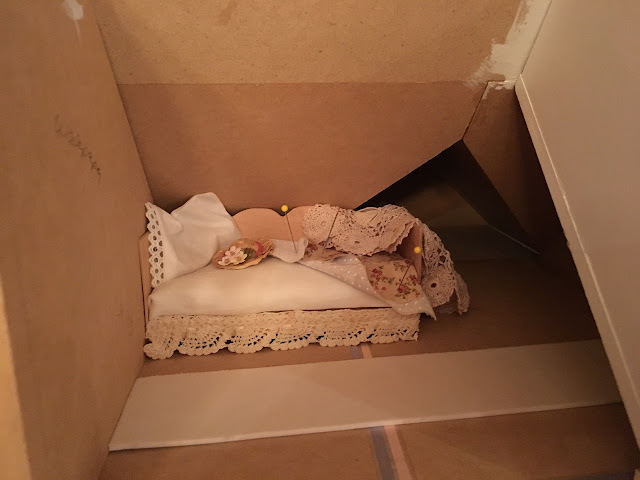 The sharp point on one side would eventually splinter off, so i removed the other one, causing the sides not to fit accurately, but a nice fluffy pillow covers up that corner. 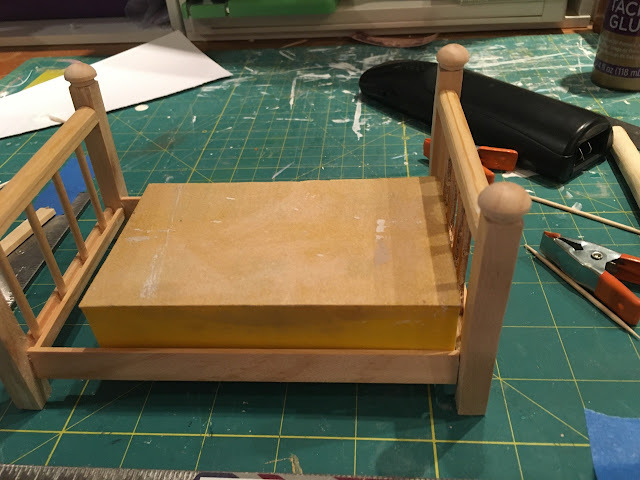 I cut a mattress out of foam board just slightly smaller than the daybed and covered it with wool batting. 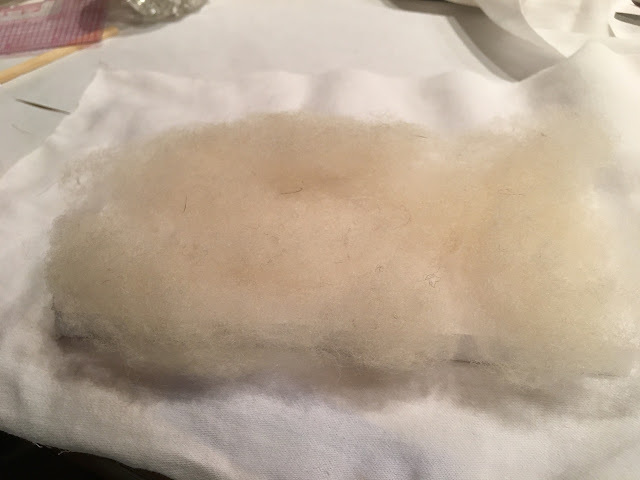 Poly fiberfill would work, but I used what I had on hand. (I made some dolls a while back that required wool batting). I covered the mattress with cloth cut from an old pillow case that was handy. Then I dug through my fabric stash, finding bits and pieces of fabric that I could use. The crocheted piece is a coaster that a blog friend sent me from England. There are six, so I try to add one to each house so that there is a touch of Elizabeth in each house. I already had the pillowcase made up and I save those silicone packets, so I stuffed on in the pillow case, but I will new pillows. 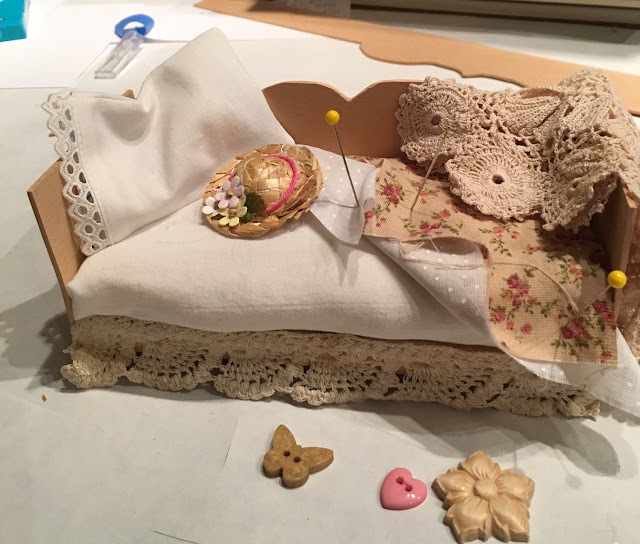 I thought about what sort of embellishments I might add, but then decided that the bedding will cover most of the bed, so I left it plain. 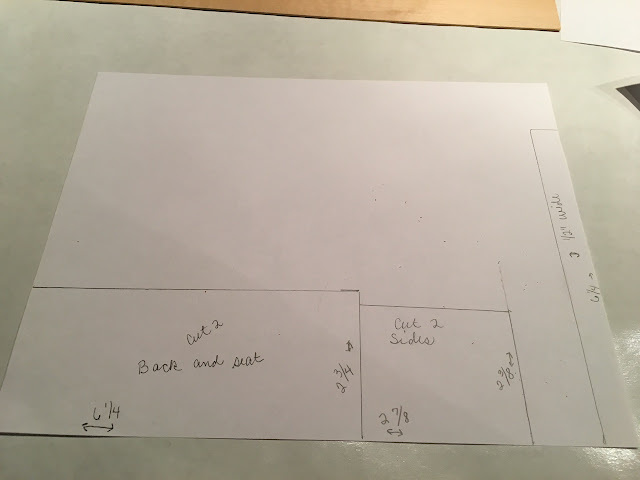 This attic room is an odd space, but I think I have a plan for it. This afternoon I painted the bed with a chalk paint, giving it a light finish. When the paint dried, I sanded it smooth and tried to adde some wear and tear. It will be a cute little space that the teen-aged girl has created for herself, her own hideaway where she has dragged things out of storage to make her little nest. I made the hall tree a while ago with the idea of using in another house, but I've never found a good place for it. 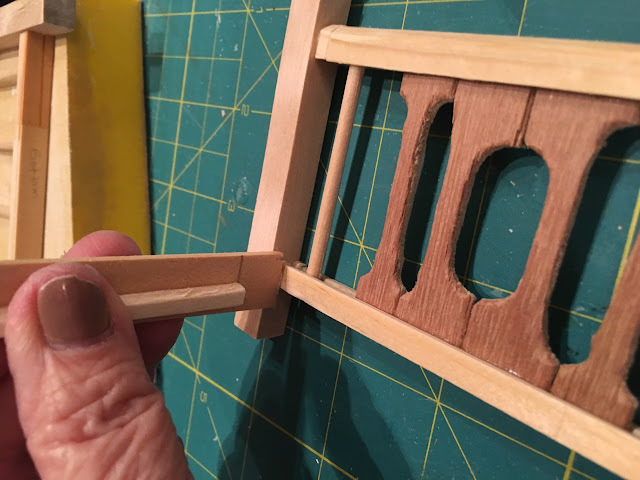 Inspired by Cinderella Moments, again, I used a new door in my stash that came without a jamb. The little hall trees are fun to make, and I think this one has now found its home. I borrowed the rug from the upstairs hall and it is just the sort of rug that would end up in the attic all rolled up, so it stays here. I don't remember where I got it. Etsy maybe, but one can just as easily be printed on muslin. 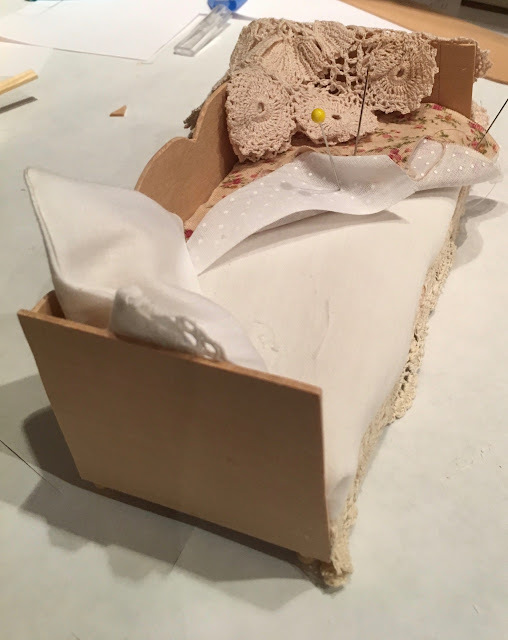 I made the chair, a House of Miniatures kit and covered it with muslin. It is rough looking, and that is okay for an old chair relegated to the attic. The young teen who is creating this little hideaway nest in the attic will find other "cool" things hidden and stashed way back in the dark corners of the attic. Stay tuned. It's spring break and my little grandson is here, so I won't get a lot done on either house. He wants to work on his house--yes, his house. He needs some furniture. He says that he is doing a Halloween house, so I think we will make him a bed. I am close to wrapping up the toy store. I have flooring to install in the loft and I have cut the ceiling paper, and I have a chandelier to install then it I will fill it with toys. 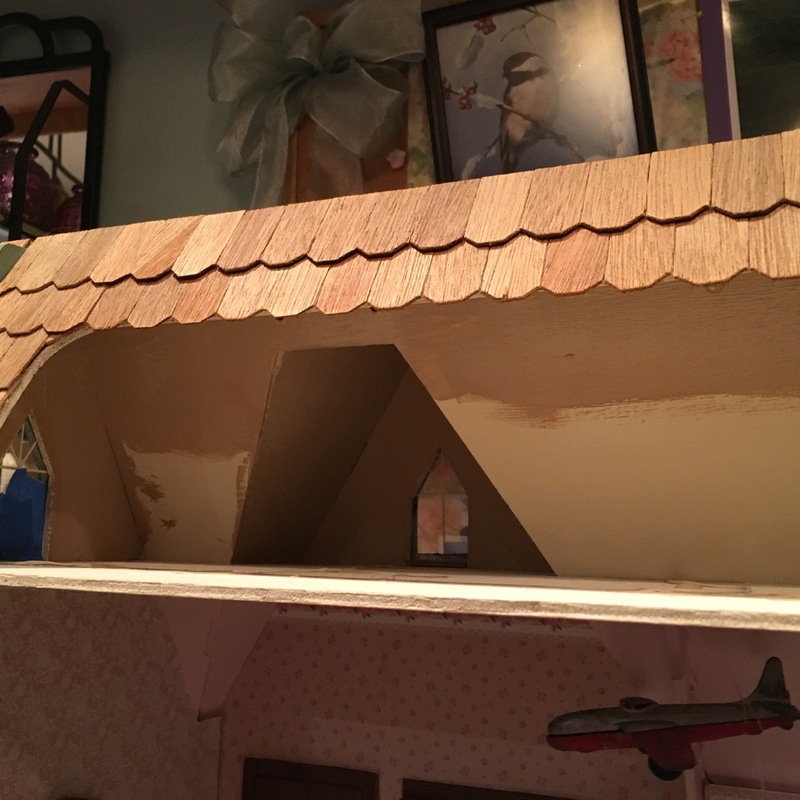 The farmhouse needs the attic finished and a roof. Oh how I dread the roof. Gosh it's good to be back home. I have been hanging out at Face Book, reading and watching what the dollhouse builders are doing over there, and they are working on some wonderful projects. I posted an abbreviated tutorial there today, summarizing the one I'll share here. Anyway. We survived the Cyclone Bomb--I did not know that was an authentic weather term. Here we had snow and then wind that blew it all away, but other parts of the state suffered and are probably still digging out. 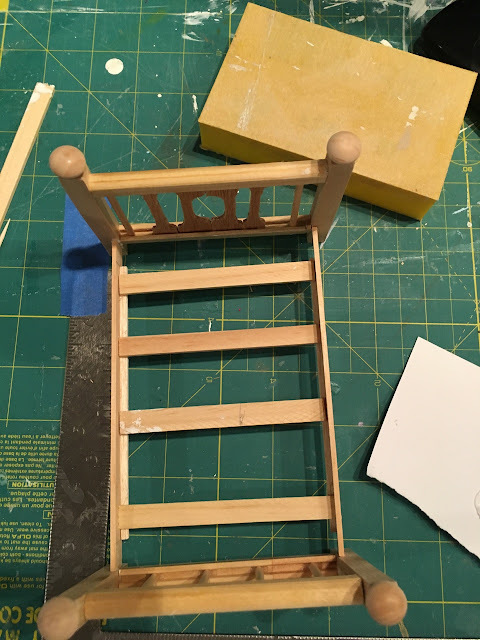 I just stayed inside and worked on my miniatures. Today, still chilly, the birds are noisy, announcing the pending arrival of spring. 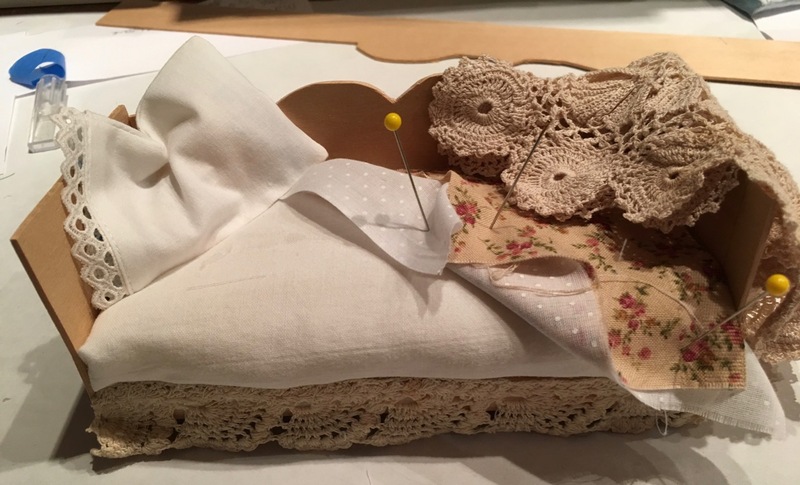 We are having two big parties here in August, my husband 50th class reunion meet and greet and the next weekend a garden wedding, so we have a lot of work to do to get ready, and I am sure that the workshop downstairs will collect dust. 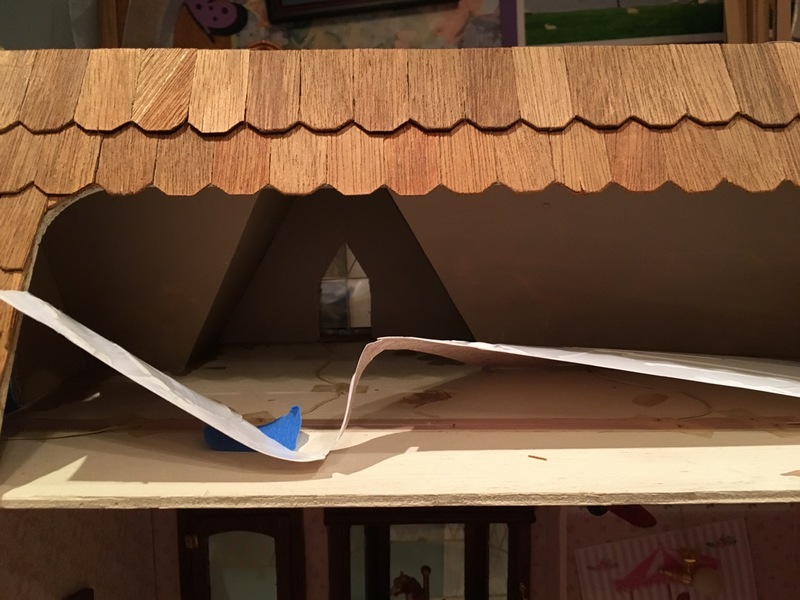 I am stalled with the toy store right now because I don't know what to put on the loft floor, so I am waiting for some sort of epiphany to hit, but I did wallpaper the loft. Originally, it was egg yoke yellow--a pale egg yoke, a yoke that lacks nutrition. 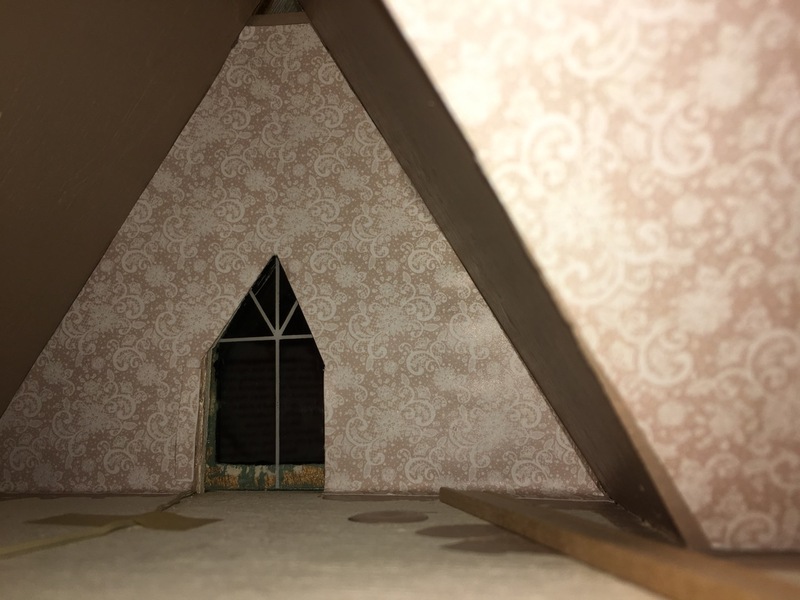 The loft is really hard to photograph because of lack of lighting, but I did paint it a luscious chocolate milk brown, you know, Nestles Quick color. 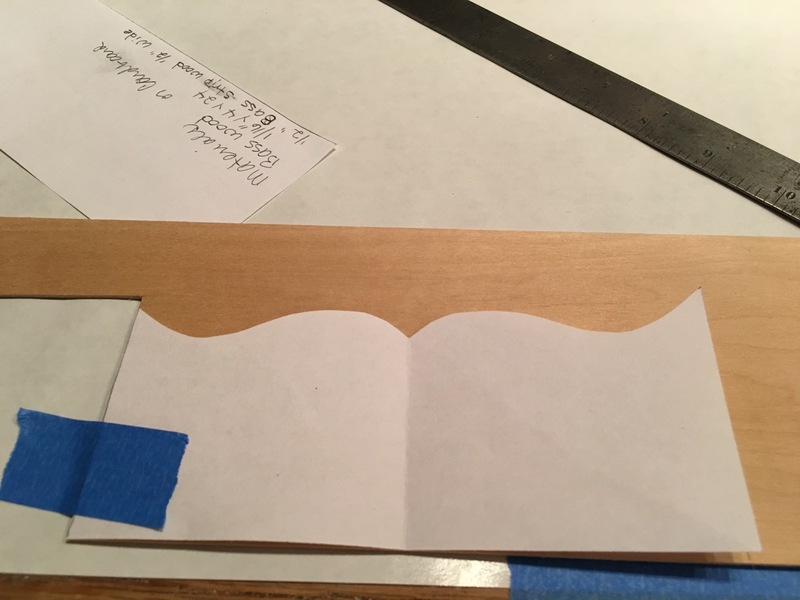 I used latex, semigloss left over from painting the real house--it may have been one of the samples, but it looks nice and I wondered if I should just it painted, but nice as as the color was, it was blah. I had two sheets of the lacy paper, so I used it up. Installing the first piece with the glue on the back was tricky. 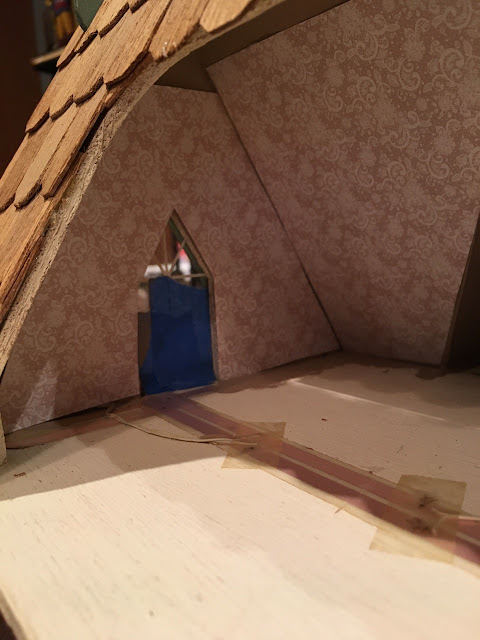 Cutting the triangle for the side walls was really hard. I have not glued them in yet because I may not. angle covered. I do like the wallpaper. Now for the floor. ???? Every now and then someone mentions going to their stash to look for a window or a door or baby just some lumber, just as I did the other night to look for lumber to recreate the display. I have decided that white would be better, but I don't want to paint this one. I spent the evening sorting pieces, for the lack of anything better to do. 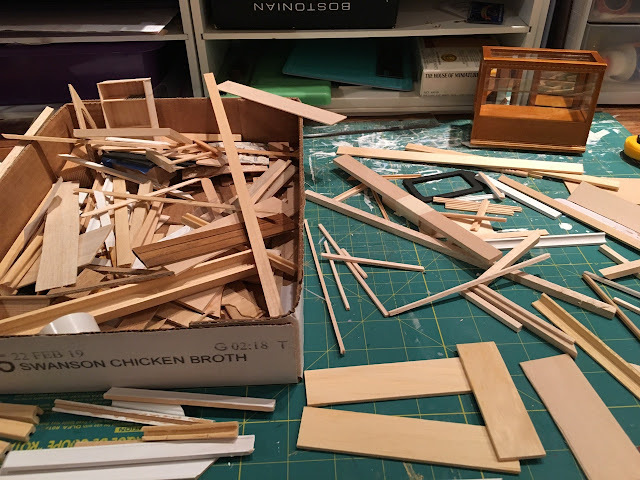 The mess was still on my work table when the 3 granddaughters stormed the craft area, eager to create something. 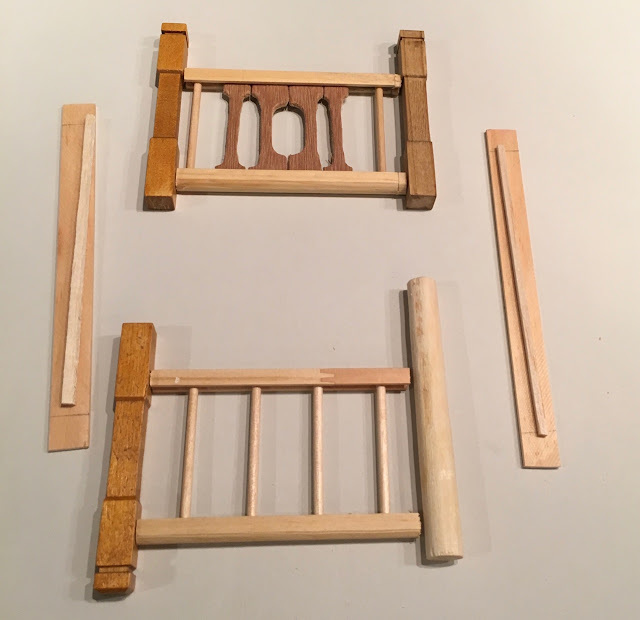 Lily became absorbed with the wood and I finally asked her what she was trying to build and she said, "A bed." 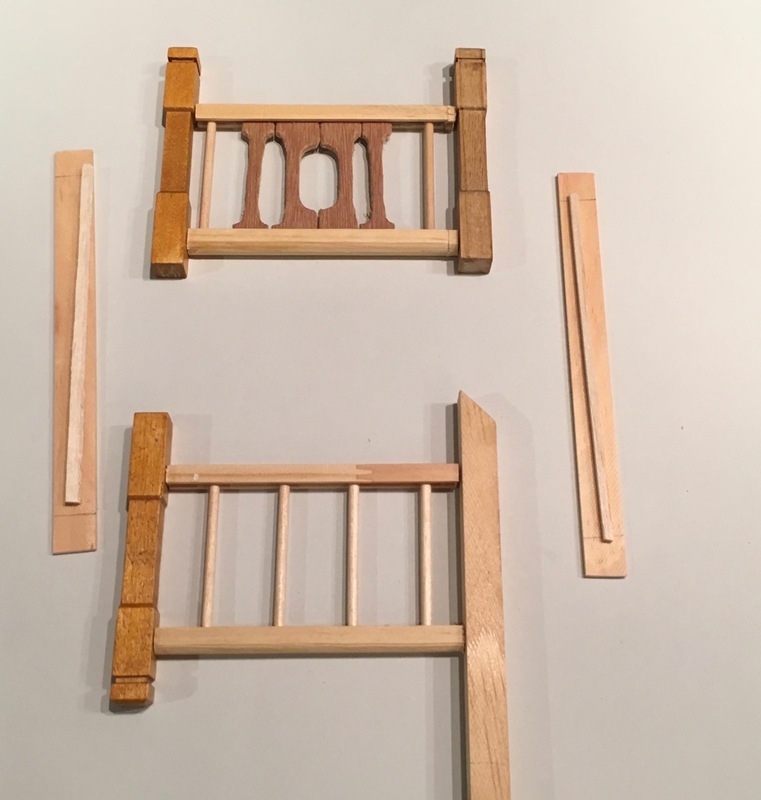 The piece that she had picked was the railing for the Bellingham Farmhouse that I had built and decided not to use because I didn't like it, so I set about going through the bits and pieces to help her build a bed. I am short newel posts. I'll use the unpainted on for the toy store and then upon closer look, I realized that the top of the posts are not all the same, so I returned to the stash to look for alternatives because the project after all is about using up scraps. 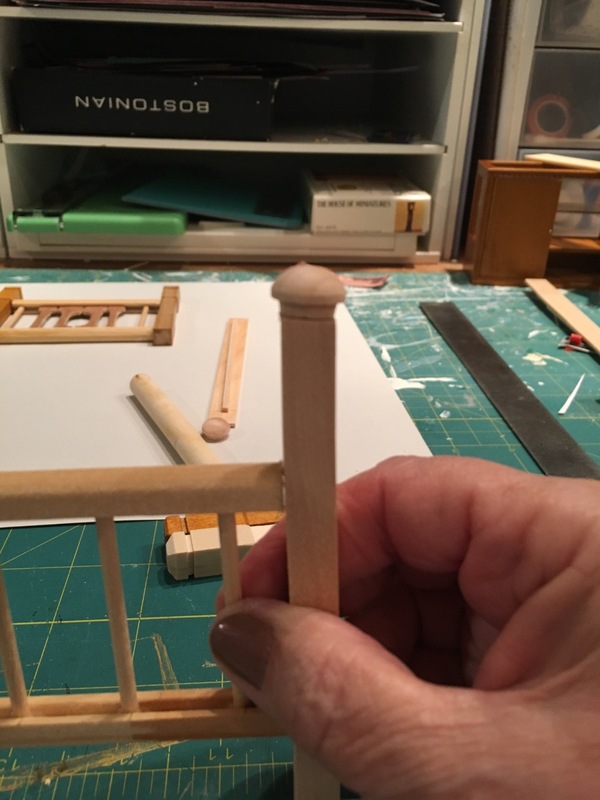 The dowel might work and if I look in the garage or the barn I might be able to a longer piece, but the rails don't match up the best. I like the post, but this one is reserved for the toy store, too. But wait; this box is only one stash. I found a second 1/4 inch post along with a wooden button (not actually what it is called) that came from another type of stash. It adds a finishing touch to the top of the bed post. The rails are not the same length, so I had to even them up. And then I had to sand the one side to get it even. With a little sanding, I slowly whittled away enough to even out the rails. 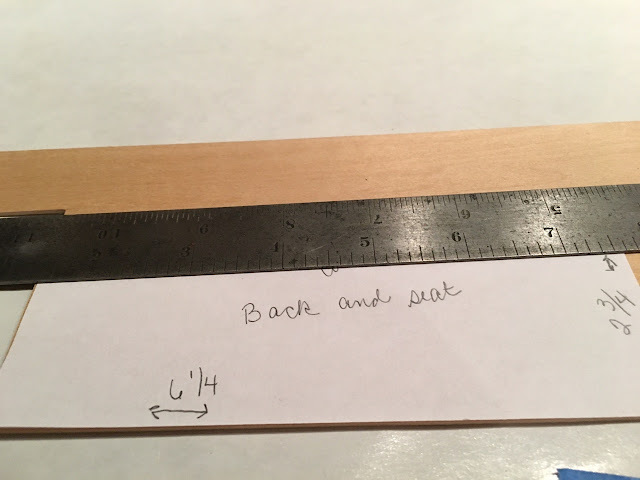 I used the lines on my quilting mat to help me determine when they were even. 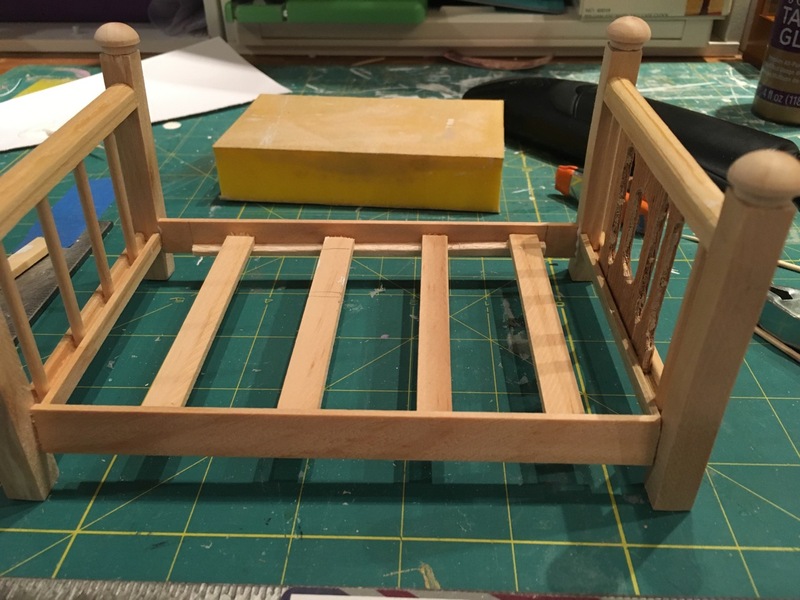 I glued on the rail to hold the bed slats and then glued the side of the bed on, but here. I finally decided to glue it to the leg to get more surface. 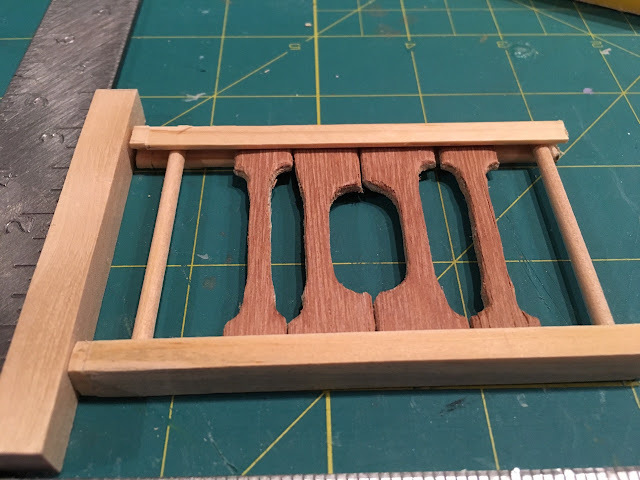 All finished; just need to let glue dry. 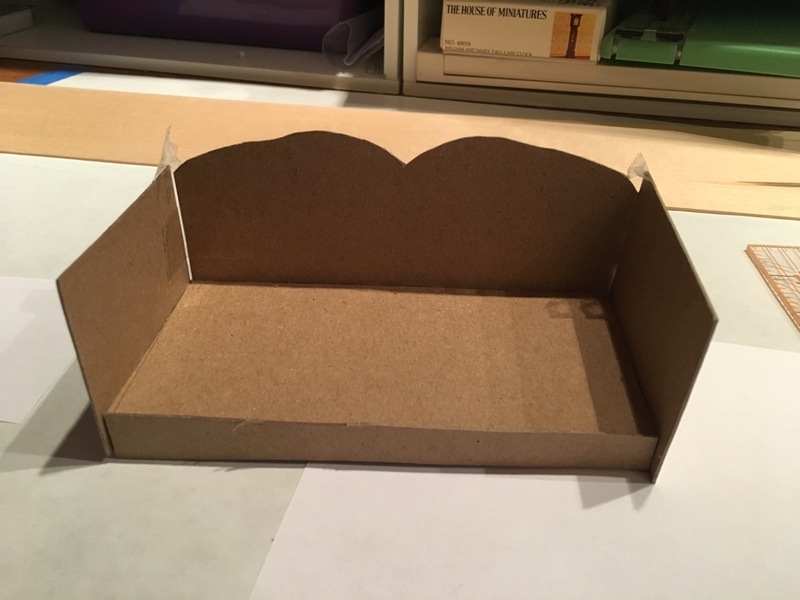 I'll make the mattress using foam board. That I do not have in my stash, so I'll have to go buy some when I get to town. 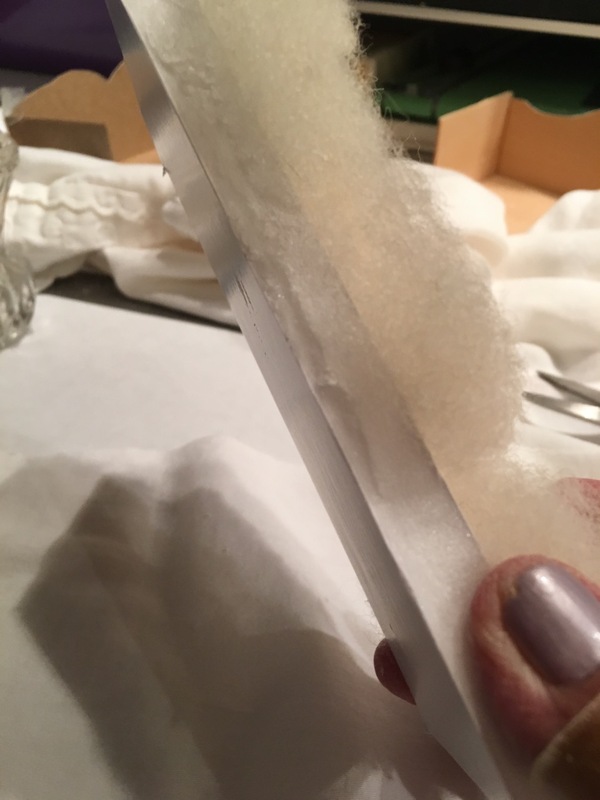 My sponge sander gives me an idea of how thick to make the mattress. 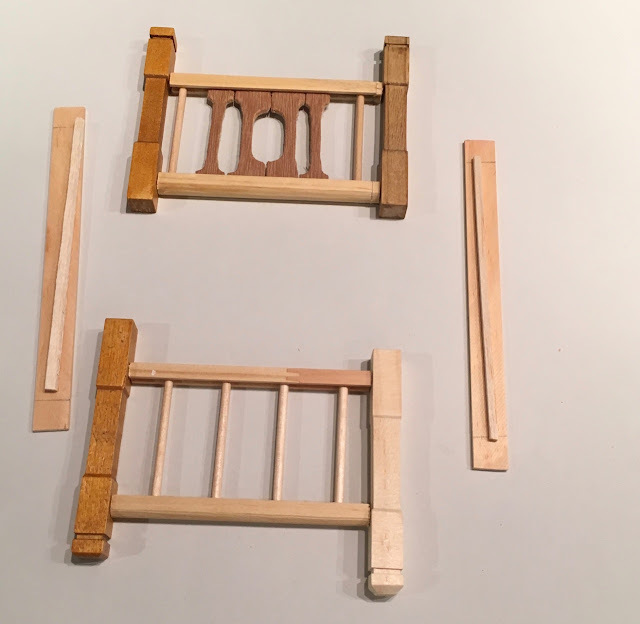 The slats are glued in, stabilizing the frame. Not bad for a bunch of scraps. I am wondering what else I could build. 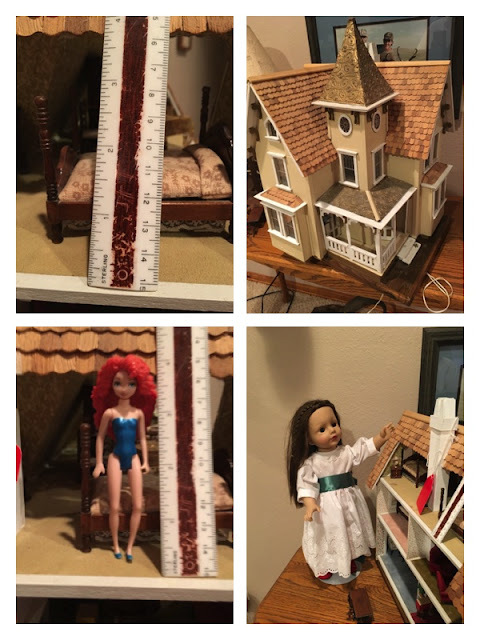 My Madame Alexander 18 inch doll ( $3.00 rescue from a thrift store) demonstrates how the half scale (1:24) Fairfield dollhouse might be perfect. Then 4 inch Merida showed up, inappropriately dressed, I might add. I think my post was appreciated it. 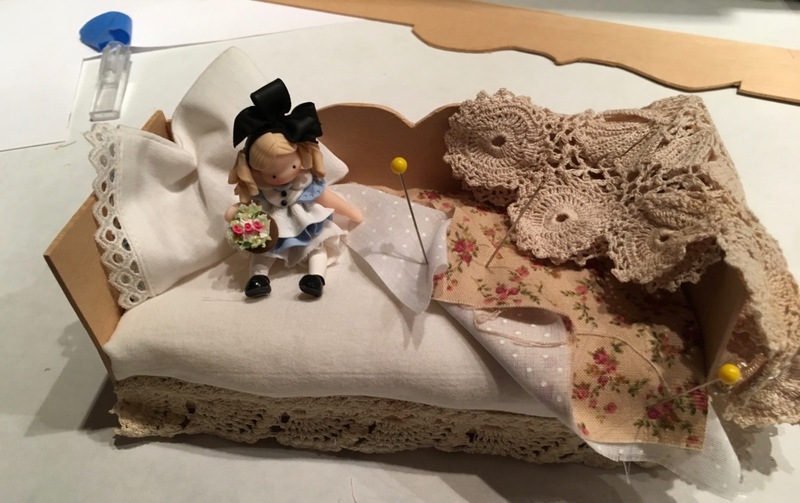 The young woman thanked me and maybe I got "A Like"
This week the granddaughters on spring break and the grandsons are on break next week, so I probably won't get much done on the toy store. 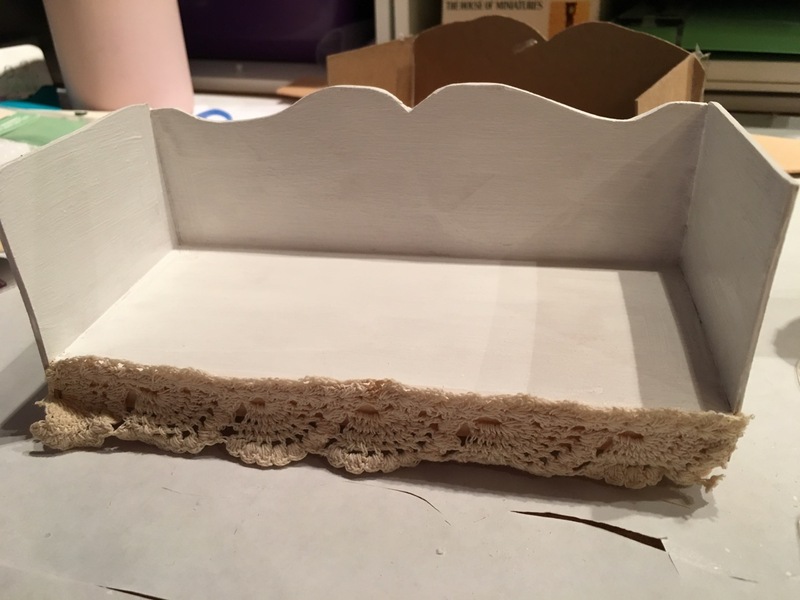 I need to figure out craft projects for the girls.